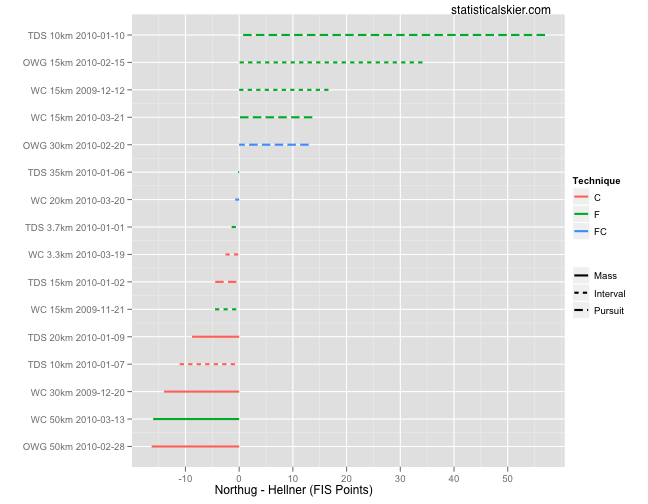 Statistical Skier : Did Petter Northug Have a Slight Edge On Marcus Hellner? Did Petter Northug Have a Slight Edge On Marcus Hellner? That’s what Marcus Hellner says, according to FasterSkier. Let’s go to the numbers, shall we? These are all the times these two guys raced against each other last season (distance races, anyway). Positive values indicate a victory for Hellner and vice versa. You can see Northug’s strength in mass start races, and that Northug had two unusually bad races. A handful of Northug’s wins were by very small margins and two of them were in stage race prologues, which, let’s face it, are kind of lame. Still, I would give Northug a slight edge here. Posted by Joran on Thursday, August 5, 2010, at 1:51 pm. Filed under Head-To-Head. Tagged head to head, marcus hellner, petter northug. Follow any responses to this post with its comments RSS feed. You can post a comment or trackback from your blog.